Historically state enterprises have been a vital method through which former colonies, suffering from a century or more of exploitation by foreign powers, can concentrate capital under the supportive wing of government power, in order to grow the economy – creating employment, services, goods, and taxation revenues. In PNG they have been used instead as vehicles to plunder the national wealth. With much fanfare Kumul Minerals Holdings Limited promised to be different. Set up in order to consolidate and manage the nation’s interests in mineral operations, this time we were told government equity stakes would yield dividends that would be plumbed into the sovereign wealth fund, and socially responsible donations. Less than two years later the champagne has gone flat. Well for some. In its most recent Annual Financial Statement Kumul Minerals reported a loss of K345 million. While these losses prevented Kumul from contributing to the public under its social responsibility policy, it nevertheless found the reserves to pay its Directors who oversaw company operations during this period of stunning loss. Indian National Arunava Basu does particularly well, netting almost K200,000 in salaries, fees, and other benefits – while Australian national, Ian Goddard took home over K100,000 in salaries and fees, with a K96,942 in termination benefits for a job ‘well done’. Other notables on the list include Southern Highlands lawyer Stanley Liria, the frontman for the Paga Hill Estate, a project steeped in controversy, and Isaac Lupari who earn’t K68,232, while also acting as the Prime Minister’s Chief of Staff. In total K1,101,329 was paid to Directors in 2016. What about company executives? 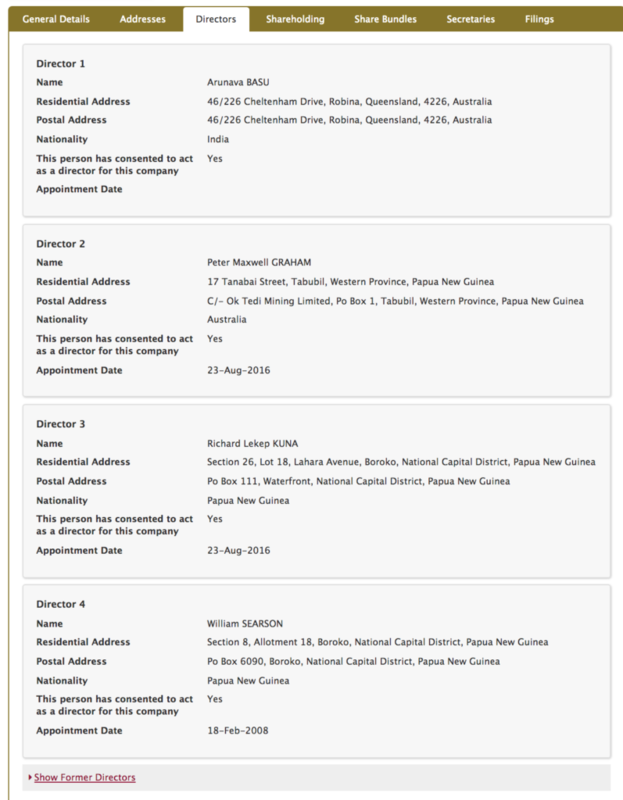 Kumul Minerals management also enjoyed a substantial windfall. Of its 24 employees it appears 10 were paid over K100,000. 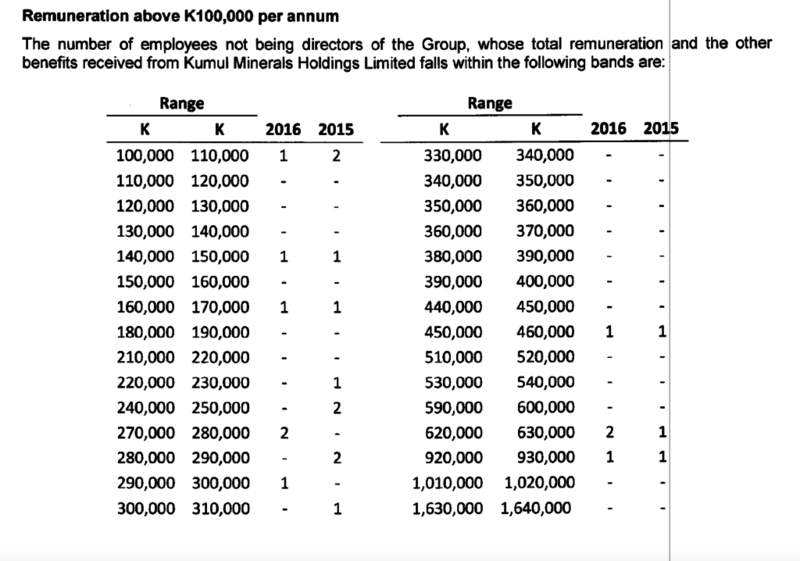 In total 10 senior executives were paid a minimum of K3.8 million, with one individual netting almost K1 million and two others earning K620,000 – during a period in which Kumul Minerals was spiralling into corporate oblivion. Despite the considerable salaries dished out to management, and fees to Directors, auditors Price Waterhouse Coopers (PWC), have predicted doom and gloom. Nevertheless PWC note that Directors remain confident they can turn the situation around. However, it appears these problems may only be the the tip of the iceberg. 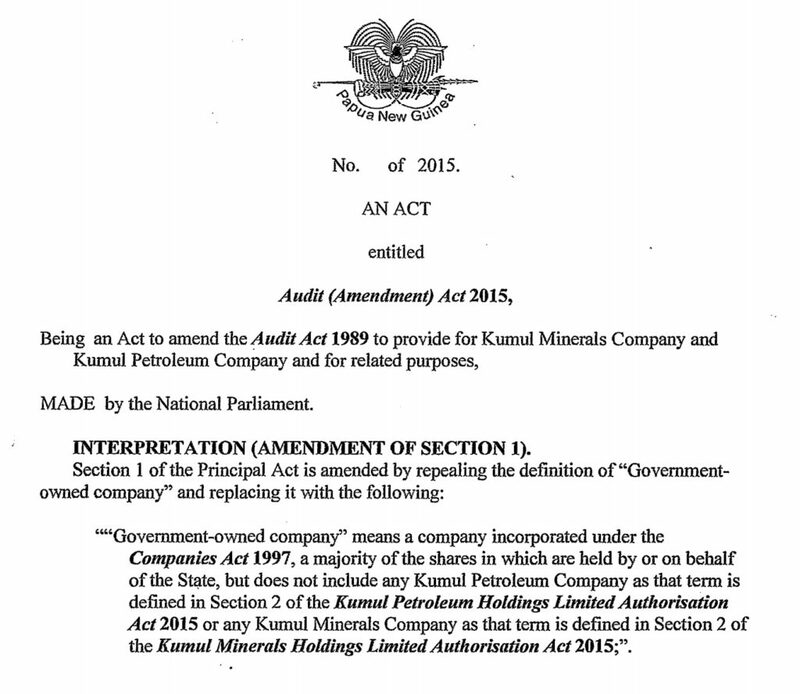 The operations of Kumul Minerals have been exempted from both the Leadership Code and the Audit Act 1989. The latter exemption was slipped in through an amending act passed during 2015. According to the Auditor General, this amendment is “contrary to the Audit Act”. This means the company is held to a much lower standard of oversight – PWC does not conduct forensic examination of original records, unlike the Auditor General. Further diluting public accountability requirements, under the Kumul Minerals Holdings Limited Authorisiation Act 2015, the company’s management is exempted from the Leadership Code. Heightening the risks even further Kumul Minerals has been exempted from the Public Finances (Management) Act 1995, arguably the most important single piece of legislation upholding good governance and public integrity. At least one arguable relief for taxpayers is that the government has breached the legislation creating Kumul Minerals which requires the appointment of seven directors. According to Investment Promotion Authority records there are only four Directors overseeing the operations of Kumul Minerals. While the public has failed to realise a return from this state enterprise, owing to record losses, a cast of directors and executives have realised significant financial windfalls as Kumul Minerals enters what appears to be terminal decline.